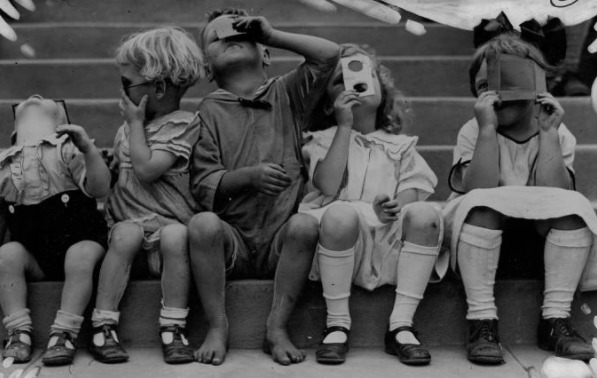 Children view a 1923 solar eclipse through film protectors in Los Angeles, California. Photo by Corbis, Getty Images. From National Geographic's 100 years of Eclipse-Chasing Revealed in Quirky Pictures. We're only one week away from the big day...are y'all ready? Hopefully, you've got your NASA-approved eclipse viewing glasses or have constructed your pin-hole viewing box out of cardboard by now; if not, hop to it! Have you ever seen a total eclipse before? 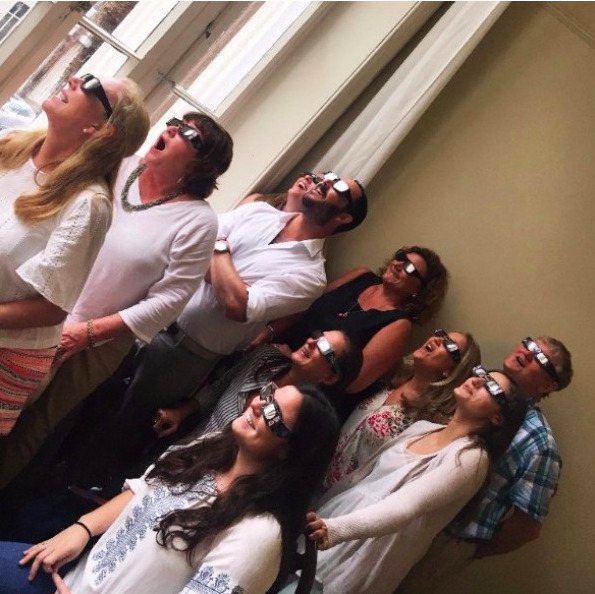 While we await next Monday's Great American Eclipse, we thought we'd poke around and see how Charleston's 'gone dark' in the past. You've probably seen a partial solar eclipse before, if not here then surely elsewhere. But, as Annie Dillard points out, "Seeing a partial eclipse bears the same relation to seeing a total eclipse as kissing a man does to marrying him." (Her essay 'Total Eclipse' was recently republished in an anthology, Abundance, and can be read on The Atlantic's website until after the eclipse on August 21st--an incredible read, by the way.) According to scientists, total solar eclipses happen somewhere on earth every 18 months or so, but the trick is to be in the right place at the right time. While the upstate of South Carolina was in the path of totality for the May 28, 1900 solar eclipse, we were still only able to see a partial eclipse here on the coast. The last time a total solar eclipse crossed the nation from sea to sea on a path similar to the upcoming event was on June 8, 1918, but alas, we were not lucky enough to see it from here. As a matter of fact, the only time on record before now that Charleston has seen a total eclipse of the sun was only 47 years ago. Some of us were actually alive then! The total solar eclipse of mid-day Saturday, March 7, 1970 started in Mexico and travelled up the Eastern seaboard to Virginia, offering less than two minutes of total darkness and three hours total for the event. According to the local newspaper coverage, hundreds watched from the Battery and from local beaches, some from the side of the road, but most people watched from their yards, or rooftops if they had access. Some scientists and amatuer 'umbraphiles' set up equipment to watch from Givhans Ferry State Park, evidently a prime viewing spot. Since we are towards the southern edge of the path of totality, we'll be more likely to see a red chromosphere and rainbow horizon than those directly in the path's center. Where are y'all watching from? Are you gonna look up? The Evening Post tells how a local appliance store had an eclipse sale (so you could presumably buy the TV after you safely watched the eclipse on it) and that a James Island couple timed their wedding ceremony to coincide exactly with the total eclipse. But lucky for us, local award-winning novelist Josephine Humphreys was here for the 1970 eclipse as well. Her husband made her a cardboard viewer like the ones pictured below (she's cautious with her eyes) and she made some interesting discoveries. It's always nice to get a poet's perspective, don't y'all think? ...I found that the actual thing, the moon-shadowed sun, was not the most exciting part of the event. We were standing at the edge of the field when strange things began to happen. I hope they will happen again this time --the first eerie surprise of daytime darkness and the growing sense of something gone wrong, something interfering with the natural order of our lives, even though rationally we realize eclipse is part of that order; the sudden cooling that accompanies the darkening, and a slight breeze lifting the grasses in the field; and the sounds of animals responding, in fear or wonder or excitement or all three -- horses snuffling, heading for the barn, and owls hooting, while songbirds went silent. And then, the reassuring return of the full sun, normal again. Something was not eating it. So, on second thought--if you can't find any glasses by Monday, don't fret. Certainly seeing Baily's Beads or the Ring of Fire will be spectacular, but just being alive and outside here in Charleston should give you a once-in-a-lifetime memory of otherworldliness. Have a Great Eclipse Y'all! 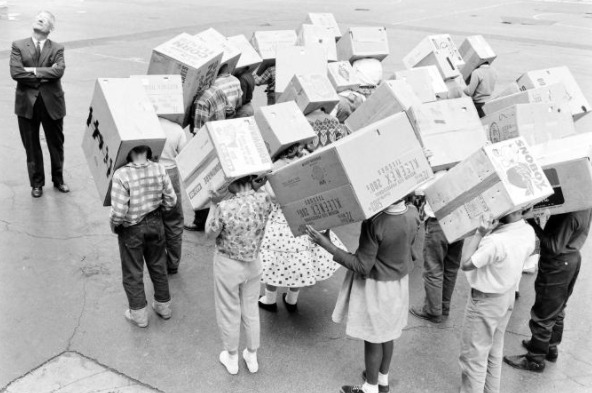 A group of 5th-grade students in Maywood, Illinois, view the July 20, 1963 eclipse with "sunscopes". Photograph by Francis Miller, The Life Picture Collection, Getty Images, via National Geographic's 100 Years of Eclipse-Chasing Revealed in Quirky Pictures.